The number of women who have hosted quiz or game shows in Australia is as low as they come: Cornelia Frances, Julia Zemiro, Sandra Sully, Kerri-Anne Kennerley, Dr. Susan Carland, Julia Morris….. But from Monday Jennifer Byrne joins their ranks when Mastermind debuts on SBS. Based on the iconic British format, it was last seen on Australian television 25 years ago. Byrne, well-known for her career with 60 Minutes, The Book Club and print journalism, will test contenders on their specialist knowledge. But in 2019 there are a few format conventions that have needed a rethink. “The only problem, and this is a slightly arcane conversation….I love the fact that it’s a woman but what is the equivalent to ‘Quizmaster? '” she asks. “‘Quizmistress’ is really too sordid. ‘Quizzer?’ ‘Inquisitor?’ So we decided ‘Quizmaster’ is a non-gender descriptor. With a female Executive Producer and female Head of Production, there are hopes the show will attract a steady stream of players to compete. “We’re obviously looking for gender parity, but men tend to dominate the quiz landscape,” Byrne explains. Byrne knows a lot about playing and all things trivia. She is proudly addicted to Trivial Pursuit -and anything that involves fun, testing and the thrill of healthy competition. “I started playing Concentration with my father. I’ve lost my na-na over Monopoly, I play 500, I host games nights when people come over. We laugh like drains!” she admits. “When we go away we take at least 6 or 7 games with us, because Andrew (Denton, husband) is the same! 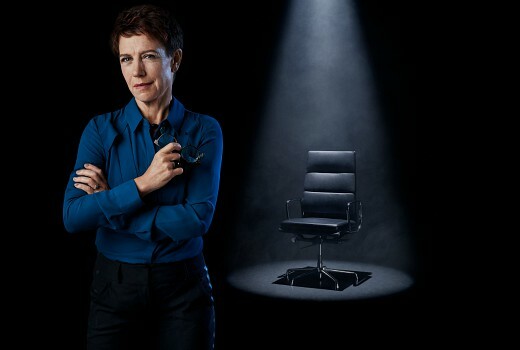 Stripped into a 6pm weeknight slot, just as Pointless looks to be exiting 10, Mastermind has hopes to reinvent the slot for the public broadcaster. Reviving a much-loved format, which began with UK host Magnus Magnusson in 1972, is a tall order -but Byrne is confident she can make it her own. “I grew up watching Magnus and the Australian version with Huw Evans and he was really good at it,” she recalls. “Magnus was a very serious unit, I don’t think I ever saw him smile. But I’m not a naturally austere, serious person. “I wanted to keep the integrity of the iconic Mastermind format. That’s the appeal. “But would I have to be that serious? We had a run through and I found it’s 2 shows in one. You’re engaging with extraordinary people with big knowledge and wonderful obsessions. The second part is being direct in 90 seconds. I’m not chummy then because it is stealing their time. “So you have to switch really quickly between both characters. I’m curious about what her area of specialty might be if she were a contender? Whilst conceding she is a rather fabulous ‘generalist,’ Byrne volunteers anything to do with horses, Pluto’s status as a planet, The Rolling Stones in the 1960s, or the novels of Ian McEwan or P.D. James.” Hmm, maybe she should try her luck on Hard Quiz? “I think Tom’s fabulous,” she replies. Mastermind airs 6pm weeknights on SBS from Monday April 15. Don’t know the original, but I might watch the next episode in place of tomorrow’s Pointless round (they’re repeats anyways!). Thought that was Susan Kennedy from Neighbours hosting for a second!!! Astonishing that a female host is still a remarkable event, showing we still have some work to do in our so called ‘enlightened times’, but her gender is irrelevant when considering the simple fact that Jennifer Byrne is the perfect choice for this show. It’s rare in the genre, but yes great choice. Hi David. How about Sofie Formica – Now You See It? Not that it changes the premise of what your point though, I was just being pedantic. The irony, didn’t Jennifer Byrne once call for SBS funding to be given to the ABC? mmm, I like the sounds of this, but the wounds from SBS axing the wonderful ‘Letter & Numbers’ from that slot some years ago are still raw! Re-runs of Letter & Numbers have been on SBS at 6pm for some time now. The final airing is on at 6 o’clock tonight.